your restaurant operation. Suddenly, you're in control. Save hours every week. Maintain financial control over ordering, labour, inventory and waste, so efficiency gets maximised. If there's a performance or compliance problem — it's easy to spot and take action. All these savings transform bottom line performance. 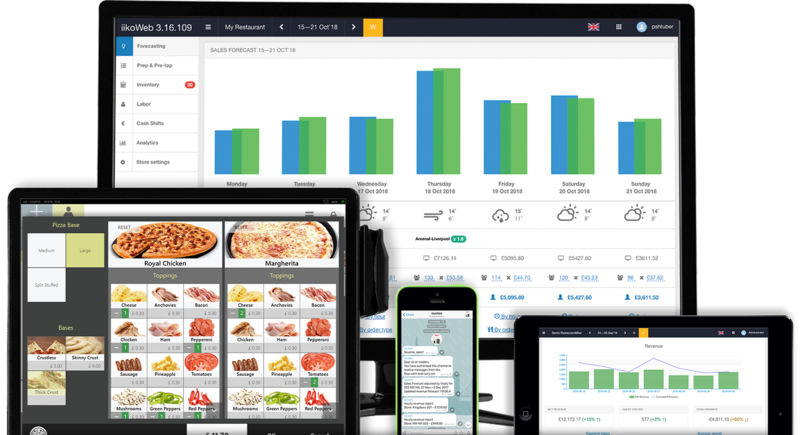 Enhance customer experience with upsell options, meals arriving accurately and on time, loyalty schemes that bring you closer to your audience, smart connectivity with ordering apps, and fast and easy tools to fine tune promotions. locations are up and running, you'll see exactly how they're performing too. "Fast and intuitive: Those are two words that sum up so much about iiko — from order taking, through to our daily operations, and getting those valuable insights we need about what's happening within our business." "Overall, iiko has been completely intuitive. It's ultra fast to take orders, run our daily operations and get valuable data to help our business. I'd gladly recommend iiko to friends across the industry." If you provide food or drink to customers, then you need iiko. It's that simple. iiko is the only all-in-one POS system of its kind created specifically for your industry alone and it addresses just the kinds of challenges you face every day. getting served fast and efficiently, so you can sell more every day. More discerning guests expect exceptional service, quality and attention to detail. You can never afford to drop the ball. Operating a business that also delivers feels like you're running two restaurants at once. Both audiences demand top service. It's vital to track guests, tables, and time, so every customer gets a great experience, from start to finish. Handling customised orders and high volumes at lightning speed is essential. Every second is precious. With profits linked to quick sales and high volumes, you need speed and efficiency to keep your bar working at its best. You can get everything you want in one package… because iiko is an all-in-one platform. Now it's easier to manage reservations and avoid awkward mistakes. Simply make bookings and add diners' details in a few clicks, using floor plans to pick the perfect tables for each party and set helpful reminders for waiting staff. Now you can get to know customers even better, offer the right promotions and give them a more personalised experience. iiko's loyalty system remembers customers and their preferences, so you can make them feel right at home. Accurate forecasting ensures you minimise waste and take full advantage of sales opportunities. You can even factor in holidays, local events and weather — to optimise your staff rota and ordering. Scheduling staff is simpler with everything online in one place. In fact, you can keep track of staff rotas, salaries, attendance, targets and incentives across the entire payroll operation. Fully integrated production control brings the kitchen team into the picture, improving communication and streamlining processes, managing the flow of the business, while storing recipes and allergen information too. You can easily monitor your inventory levels, reduce wastage — and streamline the ordering process, using accurate data rather than guesswork. You gain visibility and control like never before. The system crunches the numbers for you. It calculates revenue, time worked, cost of food, table turnover, and even revenue per square metre ... using every possible metric you might want. Want your customers to see the status of orders? Like the idea of texting them when food is in its way? How about using GPS to show how close drivers happen to be? With iiko, it's all possible. Real-time sales and productivity data is available online or through the mobile app. With instant insights and the right tools, you can improve quality and fix bottlenecks. Our customers are controlling costs, boosting profits and growing their businesses with iiko's innovative technology.